While most people are sleeping, Cora Dyslin, ’17, is working in the dark in the middle of the night with mice at San Diego Zoo Global. This isn’t your average mouse, but rather the Pacific pocket mouse, an endangered species native to California. The mouse, believed to be extinct in the 1980s, was rediscovered in 1993. Scientists consider these mice vital to the ecosystem since they function as seed dispersers for native plants. 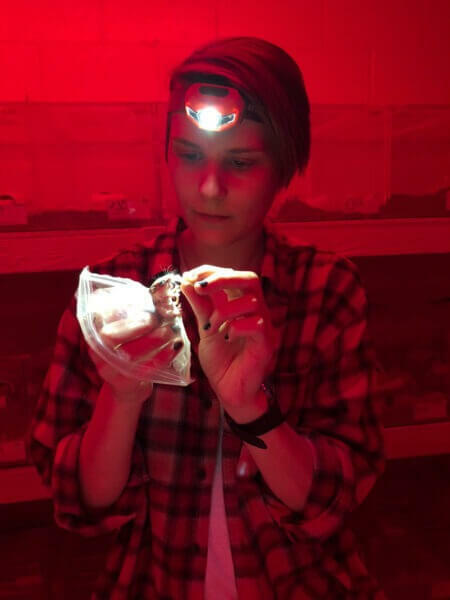 Dyslin begins her research at the San Diego Zoo Global’s Institute for Conservation Research after sundown and works under infrared light because the Pacific pocket mouse is nocturnal. She and other staff study its behavior, ecology, stress factors and genetic variations and breed a captive population to ensure that the strongest offspring are released into protected natural areas. The mission of San Diego Zoo Global is to save species worldwide, and the nonprofit organization operates the San Diego Zoo and the zoo’s safari park. Dyslin opened the door to a career there by volunteering at the breeding facility for the Pacific pocket mouse. For a few hours a week, she helped with husbandry and data scribing. As a research assistant, she does similar work, but also gets to handle the animal and perform breeding trials. Through reproduction and reintroduction of the mice into protected natural areas, the population is growing and the research in the breeding facility is making a difference in the stability of the species. Her greatest professional accomplishment happened during the past breeding season, she said, when 44 pups were born and two of those were released into the wild. “What I enjoy most about my job with the Institute for Conservation Research is that I am making a difference – though small – for our planet,” said Dyslin, who was hooked on studying the environment after seeing “The Little Mermaid” movie as a child. She believes that the job is a great fit for her because it allows her to be surrounded by others who are passionate about nature and she gets to work in different environments without being stuck behind a desk. While working on her environmental studies major, the Tinley Park native took on several volunteer jobs at Northern Illinois University to get experience, gain confidence and stand out among her peers. Dyslin trapped small mammals with graduate students at Nachusa Grasslands in Franklin Grove, Illinois, as part of a study. She obtained class credit as a lab assistant for professor Neil Blackstone and his graduate students to research the impact of climate change on octocorals, a subclass of marine invertebrates. She also worked as a research assistant to gather data on local government issues and found time to work in the Communiversity Gardens on campus. “Having experience with fieldwork and lab work helped me quickly adjust to working in this profession,” Dyslin said. She believes that Northern’s environmental studies program was the best choice because professors bring their knowledge from working in the field into the classroom and the program offers small class sizes, which allowed her to connect with professors and classmates.